Since the beginning of time, there have been two economic classes, the proletariat and the bourgeoisie. The bourgeoisie has always exploited the proletariat, taking everything the proletariat produces and giving little in return. Marxism is the belief that the proletariat working class will eventually overthrow the rich bourgeoisie and establish a classless society. 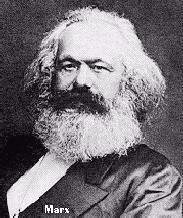 Karl Marx believed that the industrial revolution has widened the gap between the rich and poor. This causes the lower classes to become more and more discontented with their status and eventually a rebellion will occur. The bourgeoisie, with their limited numbers, will be easily overthrown and the lower classes will establish a dictatorship of the proletariat's. All means of production and all their products will belong to the public. Essentially, private property will disappear. Without a need for it, the central government will dissolve as a classless society develops. Lenin used these ideas to establish a new Russia after the overthrow of the czar.